This paper reviews and demonstrates the application of ROI and ROE decomposition. The insights gained from analyzing financial components of a business serve to identify weaknesses, opportunities for improvement, and irregularities that may signal serious internal problems. Return on Investment (ROI) is a profitability ratio based on the income generated from an enterprise divided by the investment capital put into the business (Gibson, 2011). ROI = Earnings / Total Investment. This relationship can be decomposed into various financial subcomponents from the income statement and balance sheet to isolate on changes in financial performance that are most directly contributing to changes in ROI. The illustration on the right shows some of the main components of Total Investment and Earnings. For example Total Investment is made up of Working Capital plus Equity in the business. If the owner’s reduced their equity even as earnings and working capital remained the same, the ROI of the enterprise would reflect an increase. Another ratio of profitability is Return on Equity (ROE) which compares the income of a business with the total shareholder equity invested in the business (Gibson, 2011). ROE = Earnings / Total Equity. Again using the DuPont decomposition method a clear relationship of profitability ratios can be seen. A common approach to ROE decomposition is to separate the ratios into five components for horizontal analysis comparisons between businesses and different time periods, as well as vertical analysis of each ratio to sales, asset, and income benchmarks. The profitability ratios of ROE and ROI provide measures that emerge from important financial components that can be used to isolate on internal strengths and weaknesses that alter the periodic profitability of a business. A numerical example of comparing the five factors of ROE decomposition arises when analyzing what contributes to a Lowes’ ROE of 14% while Home Depot’s ROE is 26%. An analysis of comparable ratios quickly shows that the outliers among the five factors are the differences between the two companies’ EBIT margin and Asset Turns. In the example, Home Depot has a higher ROE because they are able to convert more of their inventory to sales and do so at a higher profit margin than Lowes. 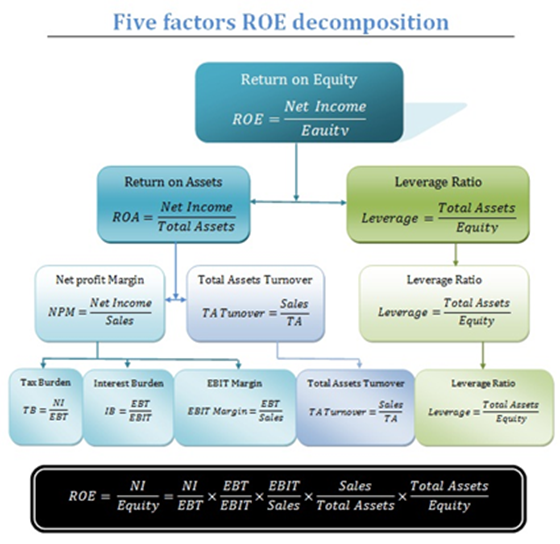 A review of the decomposition of ROE and ROI shows how the profitability ratios can be used effectively in horizontal and vertical analysis using common-size income statements. In the ROE illustration between Lowes and Home Depot horizontal analysis of profitability ratios taken in the same time period can provide valuable comparisons between businesses. Another use is comparing a single company’s ROI with horizontal values over time such as 2009 = 14%, 2010 =18%, 2011 = 19%, 2012 = 21% to visualize trends about how well a business is using capital investments to generate income over time. In another example shown in the table above a horizontal analysis of Lowes’ ROE factors can help identify for managers how ROE might decline despite slight improvements in product profit margins and asset turnover. In such scenarios investors and managers need to closely consider whether greater leverage might contribute to better returns in the future. A lower leverage ratio of 2.04 compared to 2.36 may be an indicator that insufficient assets such as on-hand inventory prevented the business from achieving better earnings results like those accomplished in 2013. In a vertical analysis of profitability the comparison of components of ROE and ROI could serve as good internal measures of company performance. For example, performance by company subsidiaries benchmarked to the overall company revenues, EBIT, or assets within a financial period could highlight subsidiary strengths and weaknesses contributing to the overall ROE or ROI for the business. The vertical analysis would operate in much the same way as a basic common-size financial statement that relies on the actual financial figures in the measured financial period. Percentage comparisons of ROE, ROI, or ROA would not be as meaningful in vertical analysis in the form of ratios to each of the ratios, though it is possible to construct such a pie chart to visualize which ratios represent a larger portion of the company’s returns on a benchmark. Again, in order for meaningful interpretation, the vertical analysis needs to remain similar to basic common-size statements using component factors of decomposition or the vertical may be used to compare subsidiary performances of profitability ratios within the same time period. The following decomposition analysis uses published financial reports for the 12 months ended March 31, 2013 and 2014 for both Honda and Toyota motor companies. The analysis begins with comparisons of ROE decomposition factors, then compares ROI factors, and concludes with direct financial applications from Prendergast (2006) using comparisons of ROCE for analysis. ROE = (Net profits / Pretax profits) * (Pretax profits / EBIT) * (EBIT / Sales) * (Sales / Assets) * (Assets/Equity). Data for the two companies is shown in the following table that reflects significantly higher amounts for the larger Toyota company than the Honda motor company. When calculated according to each of the five factors the following table results for analysis between Toyota and Honda in years 2013 and 2014. The first factor (Net / Pretax) profit is called the tax-burden ratio and for Honda the proportion of net income / pretax is larger than Toyota, meaning on average the tax burden for Honda is about 6% less. The second factor (Pretax / EBIT) is called the interest-burden ratio. For Toyota in both 2013/2014 the value of 1.06 enhances their return instead of burdening because of some inverse effects of interest or deferred taxes. In contrast Honda is relatively burdened by more than 11% differences. The third factor (EBIT/Sales) reflects higher profit margins for Toyota than for Honda in both 2013 and 2014. The fourth factor of total asset turnover (ATO) shows that Honda has more than 13% higher levels of asset turn than Toyota in both years. Lastly, the leverage ratio is about 4% higher for Toyota than Honda indicating slightly better use of assets to generate returns for Toyota. In a brief assessment of ROE decomposition the most significant outlier of all the factors is the EBIT margin for Toyota in 2014 of 9% which resulted in the highest ROE of 12.7%. While the two companies had similar ROE in 2013, significant changes at Toyota have increased ROE more. Honda’s higher asset turns and lower tax burdens are the only components keeping ROE competitive with Toyota. This decomposition gives very useful insights into ways the companies can improve their ROE. ROI = (Net Income / Sales) * (Sales / Total Assets) and relies on assets as a representation of the total investments from which to compare returns. This can be modified as suggested by Prendergast (2006) to provide ROCE and give even clearer understanding of business profitability. The tables on the left compare Toyota and Honda results for 2013 and 2014 ROI. Remarkably Toyota made a significant improvement in ROI from 2013 to 2014 almost exclusively from improved product margins rising from 4.4% to 7.1% to greatly outpace their competitor Honda motor company. The next decomposition analysis proposed by Prendergast (2006) makes two slight modifications to the ROI formula by using ‘Earnings Before Income & Tax (EBIT)’ instead of ‘Net Income’ and substitutes ‘Assets minus Current Liabilities’ for ‘Total Assets.’ This is the equivalent of multiplying the Operating Margin by the Asset Turnover ratio and the resulting ROCE comparison of the Honda and Toyota is mixed as discussed in the ROE decomposition analysis. These variations of ROE, ROI, and ROCE decompositions bring to light the components that generate increased profitability for a business. Strengths and weaknesses of two excellent businesses are clearly revealed and let managers drill down to observe and improve their competitive profitability in the marketplace. Prendergast, P. (2006). Financial analysis. Financial Management, May (2006), 48-49. Mitchell, T., Mitchell, S., & Cai, C. (2013). Using the DuPont decomposing process to create a marketing model. Journal of Business & Economics Research, 11(11), 485-495.